A team of scientists at the Walter Reed National Military Medical Center and Army Institute of Research in Washington, D.C. has discovered the first instance of a person living in the U.S. infected with a feared antibiotic-resistant microbe, according to a research report published Thursday (May 26) in the journal Antimicrobial Agents and Chemotherapy. An E. coli bacterium taken from a Pennsylvania woman suffering from a urinary tract infection contained the mcr-1 gene that conveys resistance to colistin, which physicians consider the antibiotic of last resort. “We risk living in a post-antibiotic world,” said Thomas Frieden, director of the federal Centers for Disease Control and Prevention. The continued over-use of antibiotics may lead to infections that no drugs can cure. Until very recently, no bacterial strains had evolved resistance to colistin. But this medically essential drug is used in Chinese and European livestock production. China is one of the world’s top consumers of colistin for veterinary use. Late last year, an international team of scientists working in China found the mcr-1 gene in colistin-resistant bacteria in people and animals. Why would we risk an antibiotic so vital to human health by dosing well animals with it? About 70 percent of the antibiotics used in the U.S. are deployed in livestock production. But most of these animals aren’t sick. In fact, most veterinary antibiotics go to animals to encourage faster growth or to prevent illnesses associated with confined living conditions. Microbes that have developed resistance to antibiotics are sometimes found on meat sold in supermarkets. 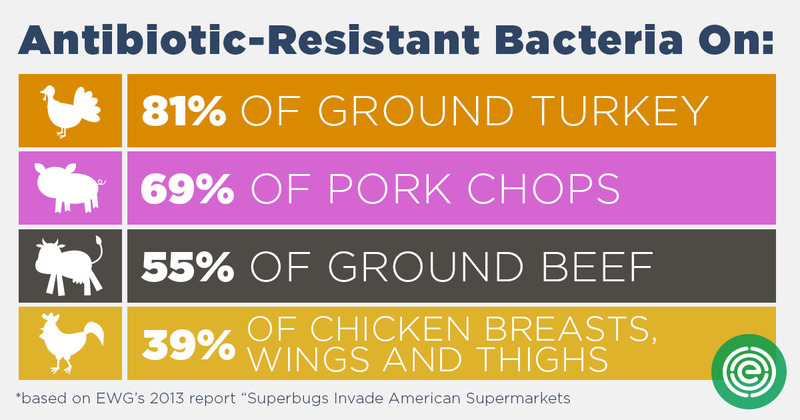 A 2013 EWG analysis of U.S. government reports showed that antibiotic resistant bacteria had been detected in 81 percent of raw turkey meat and 69 percent of raw pork tested by federal scientists. Each year 23,000 Americans die from infections of antibiotic resistant bacteria, according to the CDC. Continued overuse of medically important antibiotics could dramatically increase the death toll. But so far the federal Food and Drug Administration has taken a strictly voluntary approach to reducing overuse of antibiotics. The FDA’s efforts have had little impact. In contrast, regulators in the European Union have called for a reduction by two thirds of colistin use in livestock. Sen. Dianne Feinstein (D-Calif.) has introduced a bill that would restrict the use of medically important antibiotics in livestock. Unless we take dramatic measures now to transform animal agriculture, we risk a world where antibiotics don’t work, more incurable bacterial infections in people and a rising death toll. As a consumer, you can opt for organic meat and poultry that are raised without unnecessary antibiotics. Check out EWG’s Food Scores to learn about meat and poultry raised without these critical medicines.